Companies:Constellation Energy Group Inc Berkshire Hathaway Inc.
Reuters says BYD is working on electric-hybrid cars that it plans to sell in China starting later this year, and in Europe by 2010. 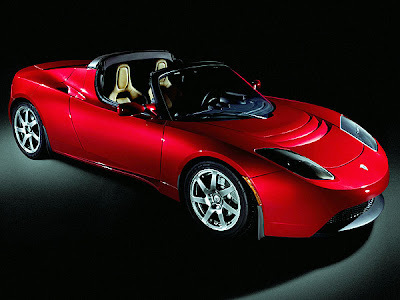 "BYD's electric cars are expected in Israel and Europe by 2010. 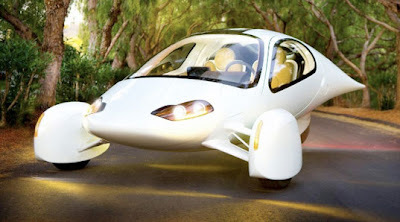 The firm has said the cars could travel 300 km (190 miles) on a single charge. A full charge needs nine hours using its lithium-ion batteries, although they could be charged to 80 percent capacity in 15 minutes. ($1=7.773 Hong Kong Dollar) (Editing by Lincoln Feast)"
for the "bargain" price of $4.7 billion, after its stock had been beaten down. Constellation has several nuclear power plants in the U.S. and has plans for more. The annual Fraser Institute survey released Thursday found many in the mining industry expect a large number of bankruptcies with some believing that more than half the exploration companies will be forced out of business. More than half the respondents believe that exploration and development activities of junior explorers will decline "a great deal," while nearly 85% say the activities of production companies will be curtailed. Nevertheless, more than 70% of miners believe that commodity prices will resume an upward trend as the economy recovers, a quarter believe prices will be stable, and less than five percent of miners believe the downward trend in prices will continue over the long term. "In other words, despite past history, miners believe that the current drop in commodity prices is the exception-increasing prices will be the rule." The Fraser Institute noted, "Overall, our respondents indicated that they spent US$3.4 billion on investment in 2008 compared with US$3.02 billion in 2007. Finally, it remains true that ‘all that glitters is gold.' We asked which mineral represents the greatest proportion of each company's budget: 38.71% of those responding to this question indicated it was gold. No other metal came close." The highest scorer on the Fraser Institute's policy potential index (PPI)-which measures the overall policy attractiveness of 71 jurisdictions in the survey-was Quebec, which also topped the list in both 2007 and 2008. Wyoming experienced a dramatic improvement, leaping from 22hd place to the number two spot this year, while Nevada ranked third on the list. Seven Canadian provinces remain in the top 10: Quebec (1), Alberta (4), Newfoundland and Labrador (5), New Brunswick (6), Manitoba (8), Saskatchewan (9), and Ontario (10). The bottom 10 rankings are Venezuela, Ecuador, Guatemala, Honduras, India, Bolivia, Zimbabwe, Kyrgyzstan, the Democratic Republic of the Congo, and Indonesia. "Unfortunately," survey coordinator Fred McMahon said, "these are all developing nations which most need the new jobs and increased prosperity that mining can produce." However, the survey discovered some good news from Latin American as Colombia showed "significant improvement this year," leaping 10 positions from 56th place last year to the 46th spot in the current survey. "The improved score might be a result of the mining community's increased confidence in the country due to its improved political stability and security-and to the mining community catching up with this news." The survey said Chile showed "stellar results," producing world-leading scores," and has been in the top 10 of the list for years. The Fraser Institute has been conducting the mining and exploration company survey since 1997. Nevertheless, the survey noted Latin America overall continues to show the most decline of all regions. "In fact, five of the bottom scorers overall are from Latin America." The survey also highlighted a number of comments from both explorationists and miners concerning various international mining regimes. For instance, an exploration company vice president said, "Indonesia stands out in my experience as a country that has lost its way in the management of its natural resources. They are being exploited in many cases in a way that is dependent on draft rather than a legislative framework." A junior mining company producer wrote, "I find Mexico a wonderful place to do business and operate a mine. Has been one pleasant surprise after another. "The vice president of another producer with more than $50 million in revenue said, "In Venezuela, if you build it, Hugo Chavez will steal it. Ecuador is a close second for similar reasons along with tribal claims." An exploration company vice president declared," In Argentina we are two years into a 90-day process for drilling permits, with the latest impasse total legal nonsense." The president of another exploration company called Botswana "the shining star of government and lack of corruption in Africa!" An exploration company manager described West African countries as favorable for mining with "exploration policies promoting exploration, political stability, respects of the rules by government, justice in place, people welcome foreign investment." A manager for a producer company with more than US$50 million in revenue, said security of tenure in Zambia "is severely threatened by new legislation and the uneven way in which it is implemented. Government has no capacity to administer complex new legislation." An exploration manager declared, "DR Congo has no rules; corruption has no limit; no justice in place; labor law is not favorable; skills are limited, re-negotiation of contract is regular," while the president of a mining company with more than $50 million revenue asked, "Zimbabwe-would anyone go there?" "Once again we hit the boom-bust cycle, despite everybody's best estimates, mining is stuck in a roughly 10-year bust cycle... "Unfortunately, governments, finance institutions, and major mining houses are to blame for short-term range investments into metal cycles. Commodities will continue to gain once the cycle bottoms out but short term pricing issues combined with a lack of ready finance will weigh heaviest on the junior mining sector who haven't the cash reserves to support loss-making production and we will see quite a few corporate failures over the coming months," said a junior mining company president. Another junior producer president remarked," Commodity prices have been ludicrously high in recent years and are now returning to something resembling sanity." One exploration company vice president warned, "Investors, particularly for nano-cap speculative investments, such as juniors, may never return to the market. The industry should prepare itself for a ‘paradigm shift' in how exploration is funded." "I cannot understand why exploration/producing companies with cash in the bank and a profit every quarter are tumbling along with ‘fly by night' junior exploration companies. Reminds me of semiconductor manufacturers and high-tech engineering companies suffering because of the dot-com bust," a geologist commented. An exploration company COO and director noted, "In some ways the current market conditions (major undervaluation of most companies) is a good thing, as it will sort the wheat from the chaff. Many companies have filed to capitalize on the last few years' boom (by either banking money or finding a great project which will help them survive). The majors are most guilty n this regard. In boom times, they publicize the fact they make massive quarterly profits, prompting governments worldwide to dust off old investment laws and look at ways of getting a slice of that pie for free. Then they fritter the money way so when times change they have to lay off all their geologists." A manager in a producer company with more than $50 million revenue, remarked, "There was a need for clean up to happen in the insane exploration and investment world. The problem is that even the great companies are paying for that today." "The current investment climate is one of mass panic as investors sell everything they can sell to generate cash," an exploration company president said. "As evidence, many companies are trading 20% to 50% below cash on hand with no value given to projects and properties." A consulting company manager noted, "Risk as been re-calibrated and small exploration companies have simply been pulled up by this metric. [Some companies] are the zombies with no funds, no hope of raising funds, and whatever bank balance is left there for the survival of the directors. These are clearly not sustainable businesses and probably never were. Here is a definition of sustainability: the company survives over one or more full commodity cycle." "No mining means: Think of yourself standing in a field in the rain and snow with no heat, no electricity, no watch on your arm, no filling in your teeth, God help us-no cell phone to call for help," an exploration company COO quipped. We are still thinking that there is more life in the world than just counting effects of Budget Deficits and Quantitative Easing complications for sovereign currencies. After all our Gold and Silver plays are so far from close to our heart drive and energy of new and coming - it is almost like slipping into Dark Ages when the main drive is survival, are we all gonna end with miserable army trucks moving our gold bars? Is there any life at all after Obama Stimulus? What Chinese are gonna be driving for that matter? We are looking for new drives, new ideas, once we move into Inflation stage of recovery from second Great Depression - what will be hot? Gold and silver will preserve value and maybe even will become Reserve Currency - we are in this field already. What is next? Energy security? Peak oil? As financial system became totally unsustainable because of cheap credit, corrupted Agency relations and pure Greed, so the basis of modern life based on cheap energy consumption is becoming the next bubble to burst. Will it lead to downsize when oil will be used mostly for Military Applications? You can not fight the war with batteries so far, only oil can drive tanks, fighter jets and aircraft careers. With all rock style accessories without any substance so far Obama is keen on one thing: energy security - he is ready to debase the currency US Dollar, to cut Medicare, to tax "rich", but he is pushing on alternative energy and energy efficiency. He must be known something that we do not believe so far: cheap oil is gone and even stronger - oil is gone for ordinary consumer within next twenty years. TNR Gold TNR.v Shotgun. TNR.v, NG.to, NDM.to, CDNX, XAU, HUI. Recent news on Nova Gold NG.to moving forward its development on Donlin Creek are very encouraging for Alaska miners. Last year vote on Gold vs Salmon brought stable political environment for mining developments, Pebble is moving forward by Northern Dinasty NDM.to as well. Gold pushing 1000 level is the fuel to overcome relatively high cost in the area, Majors are looking for elephant deposits which could replenish exhausted resources. Company has announced package of its assets in a subsidiary Bristol Explorations Co. Crash last year was not the best time to realise value of these assets, move this time will be important: whether management will be able to secure strong partners for J/V. Assets are worth in this market only when other people are ready to pay for them and substantial money must be spend to develop them. US Dollar is staring at the Abyss. Our estimations here about 2 trillion Budget Deficit is much closer to reality then most people think. "Current-dollar GDP Current-dollar GDP -- the market value of the nation's output of goods and services -- decreased4.1 percent, or $148.2 billion, in the fourth quarter to a level of $14,264.6 billion. In the third quarter,current-dollar GDP increased 3.4 percent, or $118.3 billion." With economy further sliding into recession and GDP likely to be minus 5% in our best case Reinflation scenario we will have 13.6 trillion GDP in 2009. 2 trillion USD Budget Deficit is 15% of GDP. Now lets talk about Latvian economy and its currency. The only way out is printed on the wall: debase US Dollar. With cut in Medicare and retiring baby boomers, spending will collapse further, immigrants who are holding "positive" demographic picture for the US will not be able to pick up spending. Taxes on "wealthy" hard working middle class families will become a grim reality. WASHINGTON (AP) -- President Barack Obama is sending Congress a budget Thursday that projects the government's deficit for this year will soar to $1.75 trillion, reflecting efforts to pull the nation out of a deep recession and a severe financial crisis. A senior administration official told The Associated Press that Obama's $3 trillion-plus spending blueprint also asks Congress to raise taxes on the wealthy in 2011 and cut Medicare costs to provide health care for the uninsured. The president's first budget also holds out the possibility of spending $250 billion more for additional financial industry rescue efforts on top of the $700 billion that Congress has already authorized, according to this official, who spoke on condition of anonymity before the formal release of the budget. The official said the administration felt it would be prudent to ask for additional resources to deal with the financial crisis, the most severe to hit the country in seven decades. He called the request a "placeholder" in advance of a determination by the Treasury Department of what extra resources will actually be needed. The spending blueprint Obama is sending Congress is a 140-page outline, with the complete details scheduled to come in mid- to late April, when the new administration sends up the massive budget books that will flesh out the plan. However, the submission of the bare budget outline was certain to set off fierce debate in Congress over Obama's spending and tax priorities. The budget document includes additional requests for the current year and Obama's proposals the 2010 budget year, which begins Oct. 1. The president wants Congress to extend the $400 annual tax cut due to start showing up in workers' paychecks in April, and it extends the tax cuts passed in 2001 and 2003 for couples earning less than $250,000 per year. Those tax cuts were due to expire at the end of 2010. To pay for the middle-class tax relief and the effort to increase health coverage, Obama's budget makes significant cuts on the rate of growth in other areas of health care and seeks to trim a variety of other government programs, including subsidies earned by farmers with revenue of more than $500,000 a year. The budget would also seek savings in military weapons purchases. It would raise taxes on wealthy hedge fund managers and corporations, eliminating tax incentives U.S. companies now have to move jobs overseas, something Obama repeatedly mentioned during the presidential campaign. Obama's plan proposes achieving $634 billion in savings on projected health care spending and diverting those resources to expanding coverage for uninsured Americans. The $634 billion represents a little more than half the money that would be needed to extend health insurance to all of the 48 million Americans now uninsured. Obama also will ask for an additional $75 billion to cover the costs of wars in Iraq and Afghanistan through September, the end of the current budget year. That would be on top of the $40 billion already appropriated by Congress, the administration official said. The administration will also ask for $130 billion for Iraq and Afghanistan in 2010 and will budget the costs of operations in Iraq and Afghanistan at $50 billion annually over the next several years. Obama's budget proposal would effectively raise income taxes and curb tax deductions on couples making more than $250,000 a year, beginning in 2011. By not extending former President George W. Bush's tax cuts for such wealthier filers, Obama would allow the marginal rate on household incomes above $250,000 to rise from 35 percent to 39.6 percent. The plan also contains a contentious proposal to raise hundreds of billions of dollars by auctioning off permits to exceed carbon emissions caps, which Obama wants to impose on users of fossil fuels to address global warming. Some of the revenues from the pollution permits would be used to extend the "Making Work Pay" tax credit of $400 for individuals and $800 for couples beyond 2010, as provided in the just-passed economic stimulus bill. To raise the other half, Obama wants to reduce the rate by which wealthier people can cut their taxes through deductions for mortgage interest, charitable contributions, local taxes and other expenses to 28 cents on the dollar, rather than the 35 cents they can claim now. Even more money would be raised if the top rate reverts to 39.6 percent, as Obama wants. Sen. Max Baucus, D-Mont., chairman of the Senate Finance Committee, called Obama's proposal to tax the wealthy to finance health care reform a starting point. But he wants to also examine taxing some of health insurance benefits provided by employers -- an idea rejected by Obama in last year's presidential campaign. Obama's promise to phase out direct payments to farming operations with revenues above $500,000 a year is sure to cause concerns among rural Democrats. Even after all those difficult choices, cutting about $2 trillion from the budget over 10 years, Obama's budget still would feature huge deficits. The $1.75 trillion deficit projected for this year would represent 12.3 percent of the gross domestic product, double the previous post-war record of 6 percent in 1983, when Ronald Reagan was president, and the highest level since the deficit totaled 21.5 percent of GDP in 1945, at the end of World War II. At $533 billion, the deficit in 2013 will be about 3 percent of the size of the economy, a level that administration officials said would be manageable. Associated Press writers Andrew Taylor, Ricardo Alonso-Zaldivar and Anne Gearan contributed to this report. Bad word Decoupling maybe has been spelled too much too early here, but it is true at least in one: China has the money they are spending and US Corp. has not. Feb. 25 (Bloomberg) -- Zinc climbed the most in two weeks on the London Metal Exchange after China’s stockpiling agency bought metal from domestic smelters, reducing supply. The State Reserve Bureau bought 100,000 metric tons, taking puchases this year to 159,000 tons, said four people familiar with the transactions who declined to be identified. Purchases will total 300,000 tons, one said. Zinc has dropped 55 percent in the past year. Supply exceeded demand by 195,000 tons in 2008, according to the International Lead and Zinc Study Group. Zinc for three-month delivery jumped $24, or 2.2 percent, to $1,135 a ton as of 4:45 p.m. on the LME, heading for the biggest jump based on closing prices since Feb. 6. The purchasing “should benefit the market overall” because it will “mop up excess supplies,” said Jan Altink, spokesman in London for Nyrstar NV, the largest zinc producer. Mining and smelter cutbacks have probably put the supply of zinc concentrate, used to make the metal, “roughly” in balance with demand this year after a surplus in 2008, he said. China plans to remove 800,000 tons of aluminum capacity, 300,000 tons of copper capacity and 400,000 tons of zinc capacity as part of a stimulus package, the China Securities Journal said, citing people it didn’t identify. The government may also start to buy nickel to increase state reserves, the report said. The bureau has also bought aluminum and copper this year, according to Macquarie Group Ltd.
Copper advanced $125, or 3.8 percent, to $3,410 a ton. The amount of the metal scheduled to be taken out of LME-monitored warehouses, known as canceled warrants, jumped to 30,375 tons, or 5.5 percent of inventories, from 3.3 percent yesterday. This suggests “some pickup in physical interest,” said William Adams, an analyst at BaseMetals.com in London. “Sentiment” in metals was helped by gains for equities in Europe and Asia, Widmer said. The U.K. benchmark FTSE 100 Index jumped 0.9 percent and Japan’s Nikkei 225 Stock Average closed 2.7 percent higher in Tokyo. Aluminum rose $16, or 1.2 percent, to $1,345 a ton, and tin jumped $225, or 2.1 percent, to $10,750 a ton. Nickel climbed $270, or 2.8 percent, to $10,080 a ton while lead gained $35, or 3.5 percent, to $1,030 a ton. TNR Gold TNR.v Argentina: Fidelity Says Argentina’s Bonds Are Among Best Investments. TNR.v, MAI.to, SAX.to, CGD.to, CDNX, AUY, SSRI. This is the cornerstone for all Junior plays in Argentina, all babies were thrown away with a bathwater during last year sell off on fear of default and financial collapse in the country. Robert Mc Ewen move with latest investment of 40 million CAD and de facto overtaking management of Minera Andes MAI.to speaks volumes about opportunities and valuations in Argentina. 2.7 billion for funding Los Azules could be not a so distant dream for a big players after all. Next catalyst will be rising commodities prices and Copper move over USD 2.0/lb especially in Reinflation scenario. We should expect Chinese guys soon in the picture. Follow the money, as usual, the smart one. Feb. 25 (Bloomberg) -- Fidelity Investments, the world’s biggest mutual-fund company, expects Argentine bonds to outperform in the coming year as concerns the South American country will default for a second time this decade abate. Boston-based Fidelity increased holdings of Argentina’s benchmark 8.23 percent bonds due in 2033 in the second half of last year, according to filings with the Securities and Exchange Commission. Investors are returning to Argentine bonds on speculation the government has lined up enough financing to cover its budget needs through 2010. “Argentina is one of my top picks for the next year,” John Carlson, an emerging-markets money manager at Fidelity, which oversees $1.25 trillion, said yesterday at a conference on emerging-market investing in London hosted by JPMorgan Chase & Co. The yield on Argentina’s dollar bonds maturing in 2033 fell 76 basis points, or 0.76 percentage point, to 25.63 percent yesterday. The bonds yielded as much as 30.4 percent in October, when default concerns mounted after President Cristina Fernandez de Kirchner announced a plan to nationalize private pension funds. The bonds rose 1 cent yesterday, the most since Feb. 18, to 28.25 cents on the dollar, according to JPMorgan. They traded as low as 22.5 cents in October. Local creditors agreed to extend maturities on 15.1 billion pesos ($4.3 billion) of debt last month in an exchange that will reduce the government’s 2009 debt payments by 5.4 billion pesos, Cabinet Chief Sergio Massa said on Jan. 29. Argentina began a swap for overseas holders of 8.4 billion pesos worth of the so- called guaranteed loans last week in an effort to further reduce debt payments this year. Argentine debt tumbled last year as Fernandez’s nationalization of pension funds fueled speculation the country didn’t have enough cash to repay debt amid a collapse in demand for its commodity exports. The pensions held about $30 billion of assets in October. The country’s debt lost 58 percent last year, the biggest decline since Argentina’s $95 billion default in 2001, according to a Merrill Lynch & Co. index. The benchmark 2033 bonds traded at 74 cents on the dollar at the end of August, weeks before the global financial crisis deepened. Barclays Capital Inc. last month recommended investors buy Argentine bonds maturing in 2011 and 2013, saying the country has enough financing to meet obligations over the next two years without tapping credit markets. Argentina’s bonds offer some of the “most attractive options for investors in cash credit markets,” Barclays analysts Guillermo Mondino and Donato Guarino wrote in a Jan. 23 research note. THUNDER BAY, ON, Feb. 25 /CNW/ - PREMIER GOLD MINES LIMITED (TSX:PG - News) is pleased to announce that drilling has intersected broad intersections of near-surface mineralization as well as narrow vein high-grade gold in separate target zones on the Hardrock Project in Northwestern Ontario. These gold zones confirm extensions to previously drilled open pit zones, and define the potential to identify significant high-grade mineralization in close proximity to existing mine workings in both the OREO and PIT target areas. These drill targets represent the second and third of several targets currently being tested on the property, and are in addition to the EP-Zone where the companies recently announced intersections of up to 11.8g/t Au across 11.4 meters (see press release dated Feb. 17, 2009). The current program is expected to consist of more than 50,000 metres of definition and exploration drilling leading to NI 43-101 compliant gold resources in 2009. The OREO Zone was identified in historic drilling between the two main producing horizons at Hardrock, namely the North Iron Formation and the Porphyry Hill horizons. The historic drilling, testing for mineralization between these horizons returned numerous high-grade intercepts in the area currently being tested. The current program has intersected mineralization in the OREO Zone, in addition to gold mineralization in the Porphyry Hill open pit and beneath the North Zone mine workings as tested with hole OR-02. Highlights include intersections of 6.35 g/t Au across 3.0 metres (m) and 9.95 g/t Au across 1.5 m in the OREO Zone and 13.61 g/t Au across 3.0 m in the North Zone. To date, the OREO Zone has been tested by nine holes with mineralization intersected over a strike length of 150 metres. The mineralized zone remains open in both directions. Drilling in the E-Zone continues to support the Company's goal of identifying narrow vein, high-grade gold mineralization at Hardrock. The E-Zone is located along strike from, and within the same iron formation host rock as, the North Zone deposit from which 2.97 Million tonnes of ore was mined at a grade of 7.54 g/t Au. Initial drilling has identified parallel zones within the E-Zone target highlighted by an intersection of 40.1 g/t (1.17 oz/ton) Au across 1.5 metres (m) in the E-Zone and 1.35 g/t Au across 23.0 m in an eastward step-out in the Porphyry Hill Open Pit Zone. Stephen McGibbon, P. Geo., is the Qualified Person for the information contained in this press release and is a Qualified Person within the meaning of National Instrument 43-101. The assay results contained in this press release are from core samples sent to Activation Laboratories, an accredited mineral analysis laboratory in Thunder Bay, Ontario, for preparation and analysis utilizing both fire assay and screen metallic methods. Premier Gold Mines Limited is a well financed Canadian-based mineral exploration and development company with several projects and deposits in Northwestern Ontario and a joint venture in Mexico. In the Red Lake gold mining camp, two projects are operated in joint venture with Red Lake Gold Mines, while a newly signed option agreement will give Premier a 100% interest in the strategic Lennie Red Lake Property. The company also owns a strategic project located on the main Musselwhite Gold Mine trend and the recently acquired Hardrock project in the Geraldton area. Ron Paul is talking about inflation and potentialy very dangerous outcome of combined Inflation and still a weak growth after all these ill managed bailouts. You can not raise rates to combat Inflation and its killing a weak economy. It is not a fairytale of the Gold bugs - it is Zimbabwe today. Nobody cares, General Bernanke do not have answers, he is busy driving US Dollar into the ground. Our Reinflation approach will a viable play for years to come. PPT is finally back from skiing and Saved the day and S&P 500 from penetrating November Low. Maybe they have been discussing their cut with new administration and it keeps them away from trading desks? It is not important, what is important that they are back, Gold is trashed and SPX rallied from November Low forming Healthy Bullish Engulfing candles and Double bottom hopes. 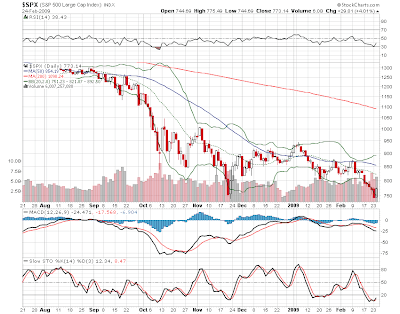 Rally should be in favor for a while and could be explosive in nature. 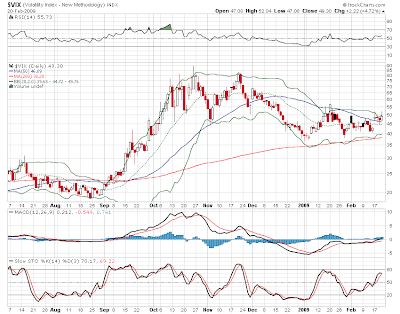 Fear VIX will go below 40, US dollar should correct down from formed Double Top and Gold will consolidate around 1000. Time is to move into risk plays: Juniors Gold and Silver accumulating on the pull backs, China FXI, Zinc, Copper, Graines - Inflation plays are bargains among Juniors. After news on Sterling Mining SRLM.ob do not forget that you are playing against all odds giving your money to somebody else to make you rich, do your homework, we here will keep you posted on our dreams, common sense in action and cynical view of things as usual. Company sounds like making a steady progress. Insiders are backing it up, crisis management is in place: cost control, focus on key properties with clear strategy - J/V partners to advance them without dilution in the company. Los Azules is still one of the major plays and company is pushing with its law suit and clearing adjacent property Escorpio IV for exploration. Robert Mc Ewen brought a lot of attention to that Argentinean story with investment in Minera Andes - operator on Los Azules. Alaska is ready for Farm Out with strong Gold prices and development of Pebble Deposit. Important will be to see new J/V picking up on El Salto and El Tapau. 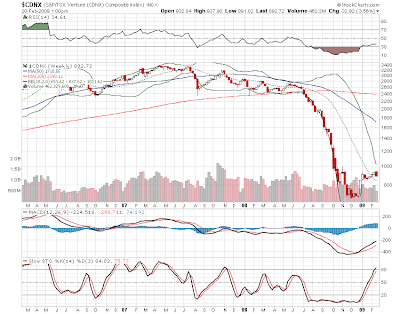 Company continues to talk about new opportunities and geopolitical diversification - it could be another positive turn. VANCOUVER, BRITISH COLUMBIA--(Marketwire - Feb. 24, 2009) - TNR Gold Corp. ("TNR" or the "Company") (TSX VENTURE:TNR - News) is pleased to provide a summary and review of corporate milestones achieved during fiscal 2008 and early 2009, which have provided TNR with a healthy outlook moving forward. The current worldwide economic crisis is a challenge for exploration stage companies such as TNR. Success depends on the ability to raise sufficient capital to successfully discover and advance projects that will become the next large mineral resources and mines of tomorrow. The cycle and spirit of exploration are seemingly lost amongst major gold companies due to mounting debts and risk-averse management's focus on earnings and shareholder perceptions as companies grow. Thus, with dwindling resources and a need to replenish them in the near future, majors should be seeking out resources being developed by junior companies. Juniors such as TNR have taken the risk out of identifying the resources of tomorrow and are well positioned as a provider to majors. TNR understands that the odds of finding mines from blue sky potential early stage properties are not only small, but also an expensive and lengthy process. This is why, since 1987, the business model for the Company has been to use its global experiences and contacts to locate early stage projects, add value to the property through its exploration programs, then bring in joint venture partners to fund the development costs of the projects. It is this corporate strategy that has enabled TNR to weather previous economic down turns. As a measure of the company's track record, TNR has successfully attracted joint venture partners on 11 of its 17 projects to-date and continues to generate new exploration prospects worldwide. In 2008 TNR focused on advancing their flagship properties, El Salto and El Tapau, with a combined budget of $3.5 million including approximately 8400 metres of drilling. We are pleased to announce that despite the market difficulties, TNR persevered and accomplished its goals to explore and add value to the properties which now allows them to be presented to potential joint venture partners. The company successfully completed a 12-hole drill program totaling 6446.45 metres. Seven drill holes in the northwestern portion of the property intersected significantly anomalous copper and molybdenum mineralization over relatively large widths including 55.35 metres of 0.205% copper and 0.012% molybdenum. These results suggest the existence of a large porphyry system with copper-molybdenum mineralization. El Salto is workable year round due to its favorable elevation of 1,600 metres, proximity to the town of Calingastas, and has access to water source (nearby river) as well as power. TNR owns 100% of El Salto's 3,300 hectares in the province of San Juan, one of the most mining friendly areas in Argentina. The area is famous for the "Yellow Belt" porphyry copper molybdenum system. A 1958.70 metre 7-hole drill program tested 3 distinct geological targets. The company is very encouraged by these results from its first reconnaissance drill program. It has extended the prospective copper-gold breccia zone to over a 4.5-kilometre strike length with the intersection of 82.25 metres of 0.49% copper located approximately 4.5km away from the past producing San Francisco mine. In addition all four holes targeted in the gold zone intersected precious-metal-bearing structures similar to those sampled on surface including an intersection of 0.75 metre of 9.15 gram/tonne Au. On February 5th, 2009, Minera Andes ("MAI") announced a preliminary assessment for the Los Azules deposit, of which highlights include a NPV of $496 million, capital payback in 6.4 years, production cost of $0.85 copper, and a 23.6 year mine life. On September 25, 2008, MAI announced high percentile metallurgical testing results at Los Azules, recovering up to 96% copper. On September 8, 2008, MAI announced a mineral resource estimate of 922 million tonnes of 0.55% copper at Los Azules, resulting in approximately 11 billion pounds of copper. TNR retains a conditional 25% back-in option on Xstrata's portion of the Los Azules deposit that MAI optioned from Xstrata. TNR commenced action in the Supreme Court of British Columbia on June 30, 2008 and subsequently amended its action on August 8, 2008, against MIM Argentina Exploraciones S.A., a subsidiary of Xstrata PLC. TNR is seeking rectification of the Exploration and Option agreement to accord with the true intentions of the parties and to remove the 36 month time provision on TNR's back-in right. TNR is also seeking confirmation of ownership, without claim from Xstrata, of the strategically located Escorpio IV claim. Joint venture partner and primary operator, Latin American Minerals Inc. ("LAT") has continued to show confidence in the La Carolina property located in the San Luis province of west-central Argentina. LAT successfully earned its 75% interest in the property during 2008 and attracted a new joint venture partner to the property who will be required to incur an additional US$3,000,000 in exploration expenditures over the next 4 years. This is yet another example of TNR's business model of identifying early stage projects, adding value to the project, and attracting qualified joint venture partners. Located on the El Indio trend in proximity to the deposits of Valadero and Pascua Lama, La Ortiguita features previously delineated drill targets with favorable metallogenic features with anomalous gold and silver values. These targets were drill tested and explored with a $1.3 million program in 2008 by joint venture partner, La Mancha Resources Inc. ("La Mancha"). Synthesis of the results is pending from La Mancha. During the 2008 exploration season the company conducted a regional exploration program to determine the probability of discovering similar deposits in the area, on the Eureka property. Access to the historical underground workings was also obtained and readied for sampling. Due to a government moratorium on the issuance of new work permits, our follow up sampling and drilling program was delayed. TNR is attempting to renegotiate the underlying option agreement to reflect the current economic conditions. If successful, TNR will proceed to obtain the necessary permits to continue its exploration program originally contemplated for the 2008 exploration season now that the moratorium was recently lifted. Following our tradition of identifying early projects, TNR is pleased to announce that on September 17, 2008 BHP Billiton transferred its ownership in the Iliamna project to TNR. Iliamna is an early stage property that is situated less than 100 kilometers from Northern Dynasty and Anglo-Gold's Pebble deposit. A $75,000 geochemical sampling program has been completed and all data has been received with results from the program to be released shortly. During 2008 TNR incorporated Bristol Exploration Co. Inc. ("Bristol") in the State of Alaska to hold 100% of its Alaskan properties. This restructuring will give TNR more flexibility in advancing these assets. John Harrop, P.Geo., Qualified Person for TNR, has prepared and approved the technical information contained in this news release. Concerted efforts from all fronts have been made to minimize overhead costs, consolidate exploration staff that are not engaged in key projects, and negotiate favorable debt settlements with suppliers and vendors. Argentina and South America continue to be a favorable area for operations. The recent Argentina default risk has come and gone and proves Argentina to be a resilient country where TNR has substantial experience in over the last 10 years. TNR is well positioned in 2009 and will continue to seek out new ventures in order to diversify our portfolio for new opportunities and lower geopolitical risk. With the financial crisis storming through North America, more people are seeking shelter in gold as evident with the cross of $1,000 per ounce last week - TNR believes this bodes well for junior exploration companies who are actively involved in precious and base metals. Positive results from these efforts, along with a successful debenture financing and experience from previous market downturns, will allow the company to explore new opportunities created by the recent economical crisis and also advance its current portfolio of properties. TNR is a base and precious metals exploration company focused on actively identifying new prospective projects and fostering work on its large portfolio of 15 properties in Argentina, as well as overseeing the exploration and development of the Iliamna and Shotgun projects in Alaska through its new wholly owned US subsidiary, Bristol Exploration Co. Inc. Very dodgy play from SNS Silver SNS.v and David Greenway, they can make more money selling "Manual how to get cheap a mine" then mining. Sterling Mining SRLM.ob was always struggling and Sunshine mine deserves better management, but this combination which looks like outright stealing is too much. We guess that lawsuits to follow Minco Silver MSV.to is defenetly not happy, will somebody stand for Sterling Mining shareholders? Chain of events included signing of merger agreement between Minco Silver and Sterling Mining in summer 2008, Minco gave Sterling 5 mln dollars loan. In September Minco dropped the transaction, but loan stayed with Sterling secured by all assets including Sunshine mine lease. Clever Mr Greenway came into picture late 2008. His team joined Sterling's Board and in a short order Board pronounced drop of lease of Sunshine mine. Guess who gets the lease the very next day after it - you know it already: Mr Greenway and SNS Silver. January 12, 2009Sterling Mining Names John Ryan As President, CEO Mr Greenway joined the Board of sterling Mining. February 23, 2009Sterling Mining Vacates Sunshine Mine Lease Mr Greenway resigned. http://www.kitco.com/pr/1267/article_02232009094844.pdf Minco Silver Foreclosure on Sterling Mining. http://www.kitco.com/pr/1267/article_02242009094117.pdf Minco Silver Comments on Sterling Mining NR. VANCOUVER, BRITISH COLUMBIA--(MARKET WIRE)--Feb 23, 2009 -- Mr. David Greenway, President and Chief Executive Officer of SNS Silver Corp. ("SNS" or the "Company") (CDNX:SNS.V - News) announces that it has entered into an agreement with Sunshine Precious Metals, Inc. ("SPMI") to assume operation of the Sunshine Mine. Sterling Mining Company, the prior lessees, abandoned the Sunshine Mine to SPMI on Thursday, February 19th at their 9:00 a.m. board meeting because of their lack of funds and inability to maintain the properties as required. Immediately following the abandonment, SPMI reached a tentative agreement with SNS to take over operation of the historic Sunshine Mine to preserve the integrity and safety of the mine. SNS is currently negotiating a formal lease or purchase of the property, and will provide care, maintenance and security of the mine on behalf of SPMI until negotiations are concluded. Effective February 19, 2009 at 1:00 p.m., SNS assumed all utility expenses and provided personnel and security to the mine site. Robert Mori, President of SPMI, commented, "Preserving the safety and integrity of the mine has always been our primary concern." He further commented: "We are pleased to be working with the owners of the Crescent Mine, as they share our concern for the integrity of the property, protection of the environment and the economic value that the mine can provide to the local economy and the State of Idaho. Mr. Mori further commented: "We are pleased to be working with the owners of the Crescent, as they are an adjacent mine, and exhibit the utmost in honesty and integrity both as professional businessmen and their stewardship of the beautiful properties that make up north Idaho." John Ryan has resigned from the Company's Board of Directors effectively February 18th, 2009. Mr. Ryan has decided to focus his attention on his responsibilities with Sterling Mining Company and has, therefore, decided to step down as a director of the Company. All options granted to Mr. Ryan will be cancelled immediately. David Greenway, CEO, commented, "We are sorry to lose Mr. Ryan from our board of directors and wish him success in his future endeavours." Minco Silver wishes to clarify and respond to Sterling's February 23, 2009 news release, in order to protect the value of the Sunshine Mine for the creditors and Sterling's shareholders, Minco Silver has offered on several occasions to step in and cure any potential defaults and to maintain the Sunshine Mine Lease in good standing including any applicable lease payments and to maintain a care and maintenance program. This offer by Minco Silver is still in effect. Why nobody at Sterling used this opportunity? Al Korelin is not getting well into this picture with his reputation. "Mr. Korelin has worked with mining and resource companies for the past twenty years as both an advisor and a Director and he has been involved with the Silver Valley Mining Association in Idaho for the past five years. Mr. Korelin founded A.B. Korelin and Associates, specializing in U.S. Securities and Exchange Commission regulatory compliance filing for foreign-based public mining companies. Mr. Korelin is also the host of the Korelin Economics Report, an internationally syndicated radio program dealing with finance and politics. Mr. Korelin holds an MBA from the University of Puget Sound in Finance and International Trade and a Bachelor of Arts Degree in Economics." This is serious commitment from Robert McEwen and it is worth maybe even more then his investment at this moment, he is making his reputation at stake. We are expecting further developments on Los Azules which will positively affect TNR Gold TNR.v. TSX: MAI NASD-OTCBB: MNEAFSPOKANE, WA, Feb. 23 /CNW/ - Minera Andes Inc. (the "Corporation" or "Minera Andes", TSX:MAI and US OTC:MNEAF) is pleased to announce that Robert R. McEwen has been appointed as Executive Chairman of Minera Andes. Minera Andes has also appointed two new directors, Messrs. Richard Brissenden and Michael Stein. Minera Andes also announced that Dr. Arthur D. (Darryl) Drummond has retired as a director of the Corporation after almost 13 years of service. Mr. McEwen is the Chairman and CEO of U.S. Gold (TSX and AMEX: UXG - News News). He is a recipient of the Order of Canada, Canada's highest civilian honor. A leading Canadian mining industry entrepreneur, with active exploration underway in Nevada and Mexico, Mr. McEwen was the founder, former chairman and CEO of Goldcorp Inc., which he built from an investment company with a $50 million market capitalization to one of the largest gold-mining companies in the world with an $8 billion market capitalization by the time he retired from the company. His achievements in natural resources have been recognized with such honors as The Northern Miner's Man of the Year Award; Ernst & Young's Ontario Entrepreneur of the Year in the Energy Category; and the Developer of the Year Award from the Prospectors and Developers Association of Canada. Mr. Richard Brissenden is a chartered accountant with more than 25 years experience in the mining and exploration sector. He serves as a director on several mining companies, including Canuc Resources Corporation, Excellon Resources Inc., Corona Gold Corporation, Lexam Explorations and Valdez Gold. He has previously served as a director of, amongst others, Metco Resources., which was purchased by Breakwater Resources Ltd. in 2008 and Hudbay Minerals Inc. from June 2003 to 2006. Mr. Stein has been Chairman and Chief Executive Officer of MPI Group Inc., a company engaged in real estate investment and development, since 1994. Mr. Stein has also held the position of Chairman and Chief Executive Officer of MICC Properties Inc., a company engaged in real estate investment and development, since 1987. Mr. Stein is also currently the Chairman of Canadian Apartment Properties Real Estate Investment Trust (CAP REIT). Between 1978 and 1987, Mr. Stein held progressively senior positions, ultimately holding the position of Executive Vice President responsible for operations, with The Mortgage Insurance Co. of Canada. Mr. Stein was a director of Moneysworth & Best Shoe Care Inc. between 1997 and 2000. Mr. Stein was also a member of the Board of Directors of Goldcorp Inc., a public natural resource company the shares of which are listed on the TSX and New York Stock Exchange, between 2000 and 2006. Mr. Stein is a graduate engineer and holds a Master of Business Administration in Finance and International Business from Columbia University in New York. Messrs. Brissenden and Stein were nominated for appointment by Mr. McEwen, pursuant to the rights he has in connection with the private placement he recently completed with Minera Andes. Mr. Ambrose, President and Chief Executive Officer of Minera Andes said "I look forward to the contributions of these new, highly experienced board members as Minera Andes continues to grow and uses its ongoing income to create new asset value and market awareness. We are also very pleased that Rob McEwen has agreed to take on a more active executive role with the Corporation." Dr. Drummond is a self-employed consulting geological engineer who lives in Vancouver, British Columbia. On behalf of the Corporation, Mr. Ambrose thanked Dr. Drummond for his many years of service to the Corporation. Mr. Ambrose said "I am very grateful to Darryl for his long-time service on the Board and his guidance, as Minera Andes has grown from an early-stage exploration company to an emerging gold/silver production company with excellent prospects for growth." The Board of Directors of the Corporation now consists of Robert R. McEwen, Executive Chairman, Allen V. Ambrose, President and Chief Executive Officer, Richard W. Brissenden, Victor Lazarovici, Allan J. Marter, Dr. Donald Quick and Michael L. Stein. Minera Andes is a gold, silver and copper exploration company working in Argentina. The Corporation holds approximately 304,000 acres of mineral exploration land in Argentina. Minera Andes holds a 49% interest in the San José Project, an operating gold and silver mine. Minera Andes is also exploring the Los Azules copper project in San Juan province, where an exploration program has defined a resource and a preliminary assessment has been completed. Other exploration properties, primarily silver and gold, are being evaluated in southern Argentina. The Corporation has 208,458,821 common shares issued and outstanding. This news release is submitted by Allen V. Ambrose, President and Chief Executive Officer of Minera Andes Inc.
As miserable as it gets with general markets sliding this year and Dow making last week a new 6 year low, Panic VIX is not in the picture to the magnitude of panic with public selling at the exactly wrong moment in last November. We will refer to our entry on Dow ans S&P 500 before for clear understanding, but we here should make an important observation: VIX is not making new highs with new Lows in Dow, Fear Index is in a clear Down Trend so far, showing that professionals are not willing to pay huge premiums for PUT protection if the bottom will fall out again. Yen has made a double bottom below 90 and is going up to 99.23 now, Euro just has made a Double Bottom and US Dollar is sliding down so far for two days from Double Top Reversal formation. Risk appetite is back, liquidity is filtering down the system, Gold is screaming Inflation and Debasement of the paper currencies is working. With new Gold highs above 1000 even with consolidation in Cup and Handle Formation at 1000 level as average, Diminishing Fear will push money into Junior sector where valuations are still depressed to the levels of End of the world scenario. 1. Underlying Currency or Commodity is back in fashion (it has happen with Gold and Silver). 2. Country risk is not exaggerated. (Canada, Alaska are already back in play - Canada Zinc Metals CZX.v Chinese investment at over 100% to the recent market price, Mexico and South America are warming up, M&A is driving interest in Argentina: Minera Andes MAi.to - Robert Mc Ewen investment - Los Azules - TNR Gold TNR.v plays, next will be Africa with Chinese - when values will encourage investments even after heavy discounting for Mess). 3. Risk appetite will push money down the food chain driven by M&A in sectors which are working, play now is searching for value and next acquisition targets: Gold is the one which is on the radar screens now. Here VIX is coming into play and next Bear rally in Dow and S&P 500 will return Decoupling back with all our reinflation plays: China FXI, Grains HAU.to and Juniors in Gold, Silver, Zinc and Copper. VIX sliding below 40 and rallying Equity markets will Cry Inflation after Gold for the deaf ones, Treasuries will continue its Bubble Bursting cycle with flood of money coming back into "risky plays" equities, commodities and emerging markets - Money will chase the returns again and will flow in reinflation plays. Is history only a guide or always a Destiny, we will find out next week. 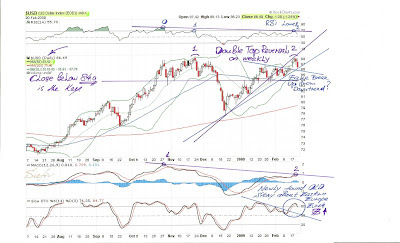 If we forget about Dow terrifying chart and Sell signal in Dow Theory, this chart is much more friendly and we will be happy to have it after after all things which could go wrong has gone wrong with Obama's Pork Bellies Stimulus. 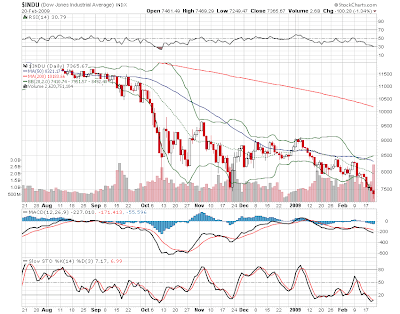 November Low is not violated, we have higher MACD, Friday session delivered a Hammer - bullish candle. Can we say Decoupling again, Financial economy which is represented by DOW, do not forget that GE is a financial company as well now as Citis and Banks of America, could be decoupling from other sectors like energy, utilities and consumer staples. Why it is important? This chart shows that if PPT will be back from skiing in Courshevel by Monday there is some chance to start a rally we were talking about, confirm US Dollar Double Top reversal and try to pretend that announced programmes are different from nationalisation of the banking and insurance sectors. For us it is important that it will pronounce that Inflation is back into the picture by public recognition. We can not be smart alone and need somebody to sell our carefully accumulated stocks in Reflation plays: first trade will be recognised in Gold move (already happen), then Major Gold producers will make new highs, Grains will rally, Basic metals will follow on China recovery. 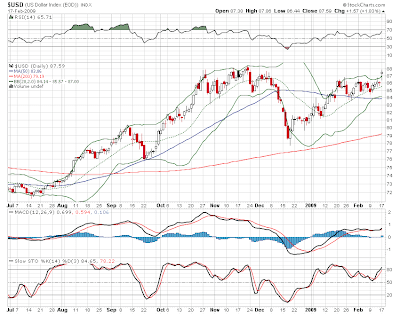 US Dollar has made a perfect Double Top formation with weak second top on RSI and MACD, Slow STO is turning negative. It is one of the most important negative divergencies now: Dow has broken down from November Lows, Dow theory made Sell signal lst week, but dollar has been sliding last two trading days. Do we have finally "normal" fundamental picture in place: when all troubles of USA Corp should send its common stocks US Dollars sharply lower? Break up from this formation above 92 will spell Big Trouble Japanese style, Depression, Deflation and we will be blessed if Dow will stop its waterfall at 5000 in a second Major Bear Leg down. Deflation means trouble for the most indebted nations, Inflation and collapsing dollar is the only medicine from reckless practices and corrupt Agents. It could help to keep Dow above the 7500, pretend that banking system is solvent in one way or another, prevent Deriviative weapons of mass distraction launch over economy and water down with debasing of its currency Liabilities in the form of Government Public Debt and Unfunded social security liabilities above 60 trillion dollars by some estimations. And do not get us wrong here, we are not smart enough to tell what to do, only to point out what must not be allowed at any price and it looks like Obama has decided that Americans are ready to pay. Gold has already pronounced what Mr Secretary can not spell out: Devaluation of US Dollar is not the future it is happening. Budget Deficits close to 2 trillion at over 16% of GDP are not boiling together with fiscal discipline. Empire is collapsing on all fronts and becoming social bailout nation when losses are nationalised and profits are allowed to keep private. Stimulus is a Joke, 2 trillion TARP2 will be plus to Deficit already above 1 trillion, States are turning back to FEDS for bailouts and Bill Gross has estimated in January it will cost another trillion. DOW has Broken Down - Collapse is imminent? DIA, GDX, CDNX, FXI, SLW. Dow has broken November's Low and everybody is bearish. Rally we have been talking about did not materialised so far. Dow theory gave a Sell last week according to Jim Paplava. We see a lot of conflicting signs. Dow is heavily exposed to financials and one talk about nationalisation has killed rally in the making. Reminder - Dow is only a reference point for us for our reinflation plays on China: FXI, Grains HAU.to, Zinc with CZX.v, Copper with TNR.v and other Juniors covered. We do not see Collapse as an imminent at this moment to be sure enougth to build Short positions. Our Gold and Silver plays are acting "Bold and Swiftly" sensing destroying of the paper currency - they have finally decoupled from general markets and we are making new highs on financials melt down. Back to general markets observations: Obama happen to be a Rock star without a band for a while, Tim the Secretary has a verbal dysfunction: he has managed to anger Chinese and then they spend time at a different parties with Obama before the "Bold and Swift" action. His general market observations were even more lethal then our blogging (our readers can not make so much distraction, we do hope) about matters we do not understand, he forget to mention after all - that all what he has been doing before was wrong and now he will make this and that and that. Markets are build on expectations and now they are expecting, and rightly so, Insolvency Admitting from the national banking and insurance system and following nationalisation. You can not talk about Stress Test with already insolvent banks, go to Monaco and make a Crash Test on Formula One - it will Crash and banks already did as well. Make up your mind and nationalise with wiping all equity out or "nationalise" with diluting it to almost zero. Taste the difference, but do not test the markets. Dow 5000 is much more closer then the people think. Deflation is too dangerous, USD is making a perfect Double Top after Moody's news about old news that Euro is exposed to more then 1 trillion Eastern Europe liabilities. What about from 2 to 3 trillion losses in USA? If it was not a Fake Break up into Second Weaker Top and US Dollar will rally further above 92 Depression and Deflation will be already happening. Gold is sensing it as well as agency problem as we have discussed on Friday. We do not like to challenge history, but all these conflicting signs are making us unsure that the break down will happen now: US Dollar is at Double Top and sliding down two last trading days, SPX did not violated November LOW so far, Vix is much lower then in November - professionals are not in a panic as public in November selling at exactly the wrong moment, Gold play becomes too obvious and is on front pagers. Should we be not bold enough to see the collapse our Gold and Silver positions will protect us, Zinc, Copper, Grains and China will be under pressure. If rally will materialise on finally some action regarding Failed banking system to isolate it from Toxic Assets (which should be written to zero), Gold could be consolidating after reaching 1000 in a weekly Cup and Handle before moving much higher. Our reward for insisting on continuous Equity play will be in Juniors, even if profit will be taken from Major Gold producers in a short term. Calls are reduced on Majors and GDX, reallocation to Silver and Juniors. If rally in general market will bring some pressure on safe heaven Gold play we will have better entry points in our cherry picking game, if Juniors will continue to rally with market we will have momentum with us. More on the charts to follow and do not forget that all our observations are not about your lunch money! It is pure Science Fiction as usual. Gold is sailing through 1000 mark, time is to pay attention to Juniors. GDX has done very well from November lows, big cap goldies like Yamana Gold AUY are on fire now, money will be going into solid Juniors with properties of merit, financing and solid management. General Markets are moving down below crucial 7500 mark on DOW, Gold story finally decoupled from financial economy, China will be next Decoupling Inflation play. Gold and Silver are ultimate currency and Commodities are means for Infrastructure development. Expect burst in liquidity to be pump now to defend USA banks and Insurance companies from admitting Insolvency. Gold above 1000 is just indicating that it is happening now. Only Gold can eliminate corrupted Agency problem ala Madoff and Stanford Financials and any FIAT currency for that matter. IRS attack on UBS and Tax Heavens is burning Gold shorts alive, money are flooding into the Gold market now. Next will be shorts in Juniors begging for shares to cover. VANCOUVER, BRITISH COLUMBIA--(Marketwire - Feb. 19, 2009) - TNR Gold Corp. (TSX VENTURE:TNR - News) confirms that the debenture offering previously detailed in Stockwatch on January 20th, 2009, has closed. The debentures have a term of one year and bear interest, payable quarterly, at 9 per cent per year, compounded semi-annually (9.2 per cent per year). The debentures are convertible by the holders at any time during the term into units at five cents per unit. Each unit comprises one common share and one warrant to purchase an additional common share at 10 cents for a period of two years. Quarterly interest payments may also be made in units, at the election of the holder. The debentures will be secured by a general security agreement, with the holders having the right to roll the debentures into any other debt or equity financing carried out by the company during the term, subject to TSX Venture Exchange rules. The company's major shareholder and director, Kirill Klip, who currently owns 18.4 per cent of TNR Gold's outstanding issued shares, is showing his continuous support by participating in the current offering. The debentures were placed using accredited investor prospectus exemptions in Canadian provinces and in certain offshore jurisdictions. The proceeds of the debenture financing will allow the company to explore new opportunities created by the recent economical crisis and advance its current portfolio of properties. The debenture financing has received conditional TSX Venture Exchange approval. TNR is a base and precious metals exploration company focused on aggressively identifying new prospective projects as well as fostering work on its large portfolio of 15 properties in Argentina, as well as overseeing the exploration and development of the Iliamna and Shotgun projects in Alaska through its wholly owned US subsidiary. US Dollar managed to shoot up from recent consolidation at weaker Double Top formation. Dow and SPX are at November lows. 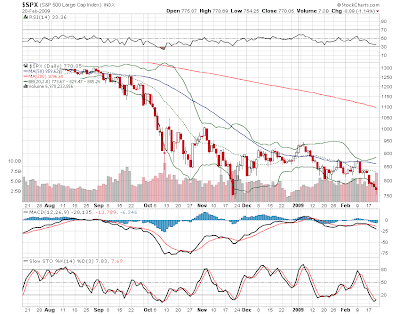 Gold, Silver, Gold miners, TSX and China FXI are showing more strength and much higher then in November. It is the Obama's moment - so far all mambo jumbo from Secretary of Treasury was not worth our attention apart from new waterfall of money. Nothing to analyse - directions instead of an action plans. Will they manage to revive the expectations today and tomorrow and deliver with the help of invisible hand of PPT rally from a more solid bottom as a double one? Below 7500 banks and insurance companies will be insolvent in mass, not just few of them, markets will become indefensible and new Bear Leg could go to Dow 5000. US Dollar above November high means Deflation and Depression and not only for USA. What will change the things as they are? Normally it is the point of total desperation when the bottom is formed. We are very close, but clear action must show that the FED is winning against Deflation. With all other things equal Gold is showing it very strong. Silver is very close to 15USD when investors will wake up and start to chase it again. We do not like to live with our golden eggs among the ruins, so Mr Obama it is time to stop to be a rock star and act as a crises manager: let the Green Fellow rest from recent struggle with gravity, Inflation will prevent Total collapse and we will enjoy slow motion deterioration and change of things.